O'More College of Design Fashion Show, Franklin Theater in Franklin, Tennessee, May 10, 2018. 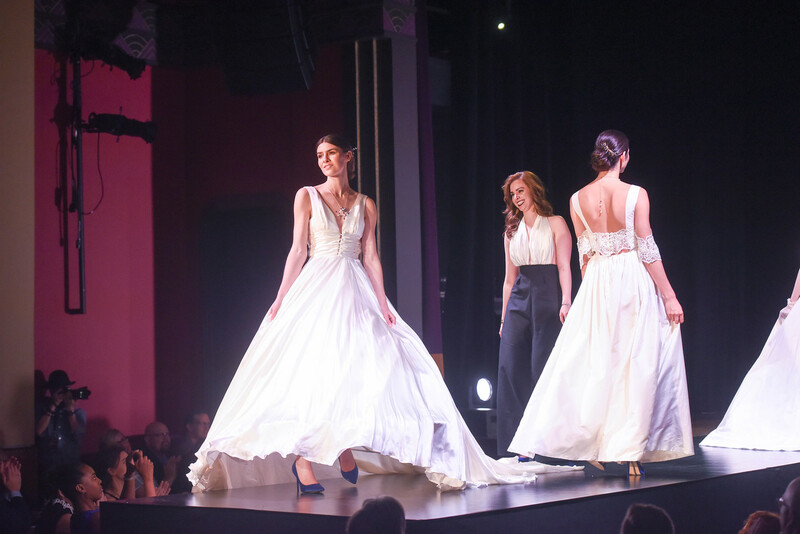 With a dazzling blend of sight, sound, fashion and dance, the O’More College Fashion Show completed its historic run before a packed house at The Franklin Theatre on Thursday, May 10 in downtown Franklin. The original collections of 22 student designers were presented on the runway before the show moves to its new permanent home this fall at Belmont University. O’More College of Design Fashion Show, Franklin Theater in Franklin, Tennessee, May 10, 2018. The show opened with a performance by New Dialect. The Nashville-based contemporary dance collective performed in costumes that were created in a collaborative effort with O’More students. When the runway portion of the show commenced, models from AMAX Talent presented the student collections, including those of nine graduating seniors. Ashleigh Cain, a senior from Thompson’s Station, Tenn., took home the Distinguished Designer award for her collection, Revival of the Fittest. The fur used in her garments was taken from the remains of ‘road-kill’ that Cain collected along the back roads of Middle Tennessee. “I wanted to give new life to the animals I found and give them a new purpose,” said Cain. The leather in her garments was crafted from salmon skin, and her textiles were created from hemp, peace silk and wool. Other senior collections were The Black Garden by Miranda Bolinger of Murfreesboro; Sacred Nature by Sydney Duncan of Paducah, Ky.; A/W 18 by Macy Harmon of Brentwood; La Femme by Emily James of Portland, Tenn.; My Best Friend’s Wedding by Peach Malone of Memphis; Ken.drama S/S18 by Kendra Martin of Cleveland, Tenn.; In Search of Color by Sarah Mast of Nashville, and SuperNova by Kelly Nieser of Cleveland, Ohio. The show also featured the work of Sarah Stevenson, a sophomore from Colorado Springs who won the 2018 Eastman NaiaTM Design Challenge. In the Eastman NaiaTM Design Challenge, students created innovative garments using fabric composed of NaiaTM, a cellulosic yarn made from wood pulp and derived exclusively from sustainably managed and certified forests. Stevenson, who prevailed over 12 other sophomore and junior fashion design students, earned a $2,500 scholarship toward her 2018-19 tuition. Morgan Stengel, a junior from Brentwood, was the runner-up. This marked the second year that Eastman, a Fortune 500 company headquartered in Kingsport, Tenn., and O’More have partnered to promote the application of an environmentally friendly fiber in original, ready-to-wear knit clothing.